Caulking can be a tedious task, so if you're going to apply silicone or acrylic latex tube caulk you're going to want a good, comfortable caulk gun. This bright orange Newborn Deluxe Caulk Gun is a high quality contractor grade gun with a 10:1 thrust ratio. It features a seal puncture tool, spout cutter, thumb release (to instantly stop caulking flow), hex push rod and a ladder hook. Suitable for use with conventional 10.1 ounce tubes of caulk. 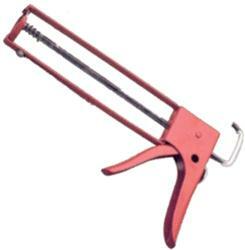 If you are undertaking serious air sealing or weatherization, this is the caulk gun for you.